Berenson Leads U.S. Hall Class - College Hockey, Inc.
Red Berenson led Michigan to the NCAA championship in 1996 and 1998. Legendary Michigan player and head coach Red Berenson is among a five-member class that will be inducted in the U.S. Hockey Hall of Fame in 2018. The group also features Natalie Darwitz, Leland “Hago” Harrington, David Poile and Paul Stewart. The 2018 U.S. Hockey Hall of Fame Induction Celebration will take place in Nashville, Tenn., on Wednesday, Dec. 12. Tickets are available at USHockeyHallofFame.com. Berenson (Michigan), Darwitz (Minnesota), Poile (Northeastern) and Stewart (Penn) all played NCAA hockey. 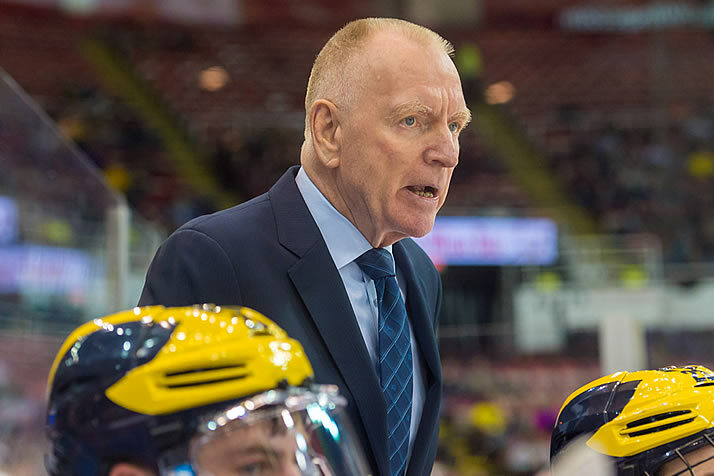 Berenson, who was among the pioneers to play NCAA hockey prior to starring in the NHL, retired from coaching in 2017 after 33 years behind the Michigan bench. He is one of four college coaches to win more than 800 games and led the Wolverines to a record 22 consecutive NCAA Tournament appearances. Berenson was a two-time All-American as a player for the Wolverines prior to embarking on his 17-year NHL career. He was a six-time NHL All-Star and accumulated 658 points (261 goals, 297 assists) in 987 career games. Darwitz played for the United States in three Olympic Winter Games after becoming the youngest player ever selected to the U.S. Women’s National Team at age 15. She holds Minnesota’s school record with 246 career points in just 99 career games and set the NCAA single-season point record with 114 in 2004-05. She was a three-time All-American and twice led the Gophers to national championships. Darwitz is currently the head coach at Hamline University in St. Paul, Minn.
Poile was MVP at Northeastern in two of his three seasons (1967-70), posting back-to-back 30-goal seasons as a junior and senior. The current general manager of the Nashville Predators is a member of Northeastern’s Varsity Club Hall of Fame. He is the longest-tenured general manager in NHL history, entering his 37th season in 2018-19. Stewart, who starred for the varsity program at Penn in the 1970s, is the lone American to play and officiate in the NHL. The first American to referee more than 1,000 NHL regular-season games, Stewart remains close to the college game. He has served as the ECAC Hockey Director of Officiating since 2007.